An interview is a face-to-face meeting, especially for the purpose of assessing the qualities of a candidate. Interviews are also conducted to obtain an opinion. For example, film stars are interviewed to get their views on any particular role, or when the prime minister is interviewed to get statement on the result of his discussion with another political leader. One of the most fundamental factors that contribute to the success of an interview is the time and quality of preparation made by you. The degree of preparedness for an interview helps reduce the uncertainty and anxiety prior to the interview. The amount of effort you wish to put into preparation is directly proportional to the importance of the interview. What all you need to do before an interview? a. Selectors cannot comprehend why and how a person can say he is keen to join their company which he knows little or nothing. b. From the interviewer’s point of view the good applicant is one who has done some homework about the organization. a. A brief history of the organisation. b. It’s main features like revenue, profit, number employees etc. d. Any important issue of the organisation that has been newsworthy. e. Key people in the organisation. a. It is but natural that interviewers would quiz you on your field of specialization. b. You may like go back to the principal text books and refresh your knowledge definitions, formulas, concepts and other related issued. c. An interviewer judges your ability to perform on future tasks on the basis of your past performance. a. You should list your achievements, academic qualifications, prior experience and extra-curricular activities. b. Such achievements, or claims may be authenticated by certificates or photographs. c. The important ones may be photocopied and attached with the resume while the originals of all certificates should be neatly catalogued in a folder and kept at hand for reference should the interviewer ask for them. Names of President, Vice President, Prime minister, and State Capital Names, Newton laws, Basic Geography like rivers names should be brushed up. You should be able to answer questions like, what is management? How a fan works? What is sensex? etc. Some time interviewers pose questions like, what are the other uses of pen. You can say, "It can be used as book mark, girls may use it as a hairpin, as a weapon, punching holes, tension buster by rotating with your fingers, status symbol etc. Prior to entering the door, adjust your attire so that it falls well. Before entering inquire by saying, ‘May I come in sir/madam’. If the door was closed before you entered, make sure you shut the door behind you softly. Go near to the panel and confidently say ‘Good day sirs’. If there is one woman, then wish the woman first then wish the male interviewers next. Don't sit in the chair. Seek permission to sit down. If the members of the interview board want to shake hands, then offer a firm grip first maintaining eye contact and a smile. Don't extend your hand for handshake. This enthusiasm comes across in the energetic way you put forward your ideas. You should maintain a cheerful disposition throughout the interview, i.e. a pleasant countenance holds the interviewers interest. Briefly is the hallmark of a good communicator. It is recommended that you volunteer information, but this must be done in a lucid and to-the-point manner. An over-talkative or verbose person is instantly disliked and misjudged. If you do not know the answer to a question, it is better to acknowledge it, rather than trying to cookup something to answer. The interviewer will respect your honesty. In our experience, interviewers immediately start grilling a candidate if they suspect him or her of lying. A little humor or wit thrown in the discussion occasionally enables the interviewer to look the pleasant side of your personality. If it does not come naturally do not contrive it. By injecting humor in the situation doesn’t mean that you should keep telling jokes. It means to make a passing comment that, perhaps, makes the interviewer smile. Mostly interviews are conducted the whole day leading to tired minds. A little humour as a starter will ease the fatigued minds. However, if you do not have the knack of humor, it is better not to get into it. You must be proactive in offering information about yourself as the interviewers will be willing listeners. The way you conduct yourself reflects your upbringing and your culture. It is good to project an air of humility. Over confidence is often misinterpreted by interviewees as arrogance. Polite statements are recommended. During an interview, slang will probably not be understood, and certainly not appreciated. Your communication needs to be as formal and explicit as possible. Your posture during the interview adds or diminishes your personality. Your should keep all certificates, testimonials and other relevant documents neatly on the table, preferably in a single file. Mannerisms such as playing with your tie, theatrical gesticulations, shacking legs or sitting with arms slung over back of adjoining chair must be avoided. It is vital to be conscious of your posture and gesticulations as they tell a lot about our personality. Many interviewees believe that an interview is a one-way street, the helpless ‘victim’ struggling to be selected and the ‘ all powerful’ being in whose hands lies the destiny of the interviewee. It is myth. You may ask a question/clarify information if necessary. It is quite in order and much appreciated by interviewers. You must maintain eye contact with the panel, right through the interview. This shows your self-confidence and honesty. Many interviewees’ while answering, tend to look away. This conveys you are concealing your own anxiety, fear and lack of confidence. Maintaining an eye contact is a difficult process. As the circumstances in an interview are different, the value of eye contact is tremendous in making a personal impact. It is imperative for you listen carefully to the question being asked. If a question is not clear, it would be quite in order for you to seek clarification on the same. Seeking a clarification is far better than giving an irrelevant answer. It is very annoying for interviewers when an interviewee misinterprets the questions, and answers by saying something which is irrelevant. Many interviewees adopt a stance which is not their natural self. 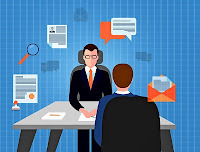 It is amusing for interviewers when a candidate launches into an accent which he or she cannot sustain consistently through the interview or adopt mannerisms that are inconsistent with his/her personality. Interviewers appreciate a natural person rather than an actor. It is best for you to talk in the natural manner because then you appear genuine.